Starting right after the first film, mush hasn’t changed. That new sense of confidence is dashed quickly. However a fan of supers contact Mr. and Mrs. Incredible as well as Fro-Zone. The plan is to bring supers back into the limelight by showing how much good they do. They decide to focus on Elasti-Girl, as she’s very cost effective. This means she causes less collateral damage. Have her do some hero work and then use that as base to bring supers back. Elast-Girl’s first days as a solo hero has her dealing with the mysterious Screenslaver. Mr. Incredible has his hands full dealing with helping Dash with school, his daughter Violet’s love life, and the fact Jack has so many powers. Elasti-Girl is smart and capable and her scenes like chasing the train or fighting Screenslaver are great. Mr. Incredible’s struggle as parent is interesting and allows for the jack vs Raccoon fight which is incredible. I like Edna Mode’s scenes and how she takes to Jack. The kids getting the chance to rescue the parents is fantastic. It’s just a warm action packed superhero film. It has so much heart and I love the family dynamic. Something that has been lacking in the wave of all these superhero films and TV shows. The closest might be Black Lightning but still a different dynamic. I liked the addition of Voyd. I know its probably unlikely to see more of her in the future but if they do a third one, I’d be happy to see her again. The only real downside is the villain is somewhat predictable. Still, if you loved Incredibles you are going to be happy. I was. Tag is good. I thought at least. It’s not a great comedy. But its far from a bad comedy. So, very loosely based on a true story about a group of friends who have played tag for decades. There is a list of rules and the play it throughout may. The story starts when Ed Helms character (Hogan) tags Jon Hamm’s character (Bob) during an interview with a reporter from the Wall Street Journal. Hogan talks about how its the year they get Jerry (played by Jeremy Renner). He has a wedding coming up at the end of month of play, and hasn’t invited any of his friends. Jerry’s never been tagged and is supposedly retiring after the season. The journalist (played by Annabelle Wallis) comes along because its a more interesting story. Hogan, his wife (Anna played by Isla Fisher who should be in bigger films), and Bob grab Jake Johnson’s character Chili and then Hannibal Buress’s character Sable. First act done they get into trying to get Jerry. So that’s the film. Trying to tag Jerry until just part way through the third act with a depressing twist kicks in but the film tries to go out light hearted. There is a part with an old love interest that complicates the game. Some melodrama to pad the story out. I get why some people don’t like the film. 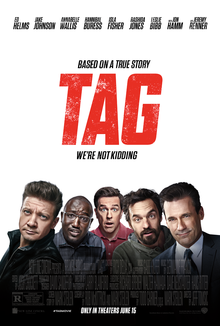 It’s a movie about grown men playing tag. It’s not exactly something that has high stakes until they try to put stakes into the film and it doesn’t quite work. Yet, if you just one something laid back with some pretty amusing visual cues and damn fine cast, I say check out out. This entry was posted in film, movies, reviews and tagged film, movies, reviews. Bookmark the permalink.